Blog Something happens every hundred years in Charleston and it's happening now! Something happens every hundred years in Charleston and it's happening now! 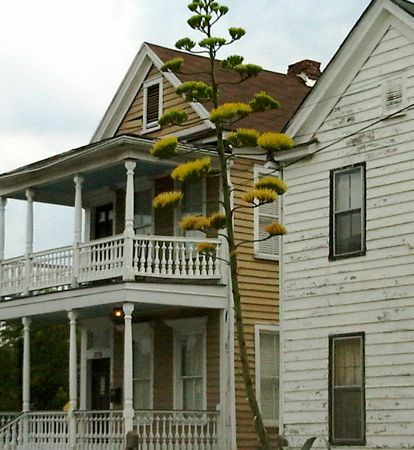 Actually, it might be every sixty years according to some mysteriouse mother nature calendar, but Charleston South Carolina has blooming century plants. These exotic plants look like they belong on some distant dessert planet, but you can spot them all over town. This crazy bloom (pictured below) is on Coming Street at the Crosstown. A native of Mexico, the century plant is so named based on the belief that it bloomed once every 100 years. Botanists say it’s more like 60 years here in the northern latitudes. So much energy is expended in the growth spurt that the main plant generally dies when it’s completed.Indigenous cultures used sap from the Agave americana for medicinal purposes. Its seeds were ground to make flour for bread, and the pulp from its leaves was used to make beer and tequila.